A blend of stinging nettle, red clover, milky oat tops and oatstraw with a dash of stevia. 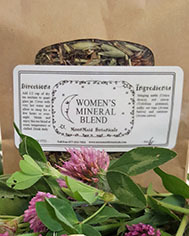 This potent blend of herbs is a powerhouse of minerals that are so important during menopause and at any point in our life. Can really help with hot flashes and vaginal dryness. Full of vitamins and minerals – an infusion of this blend will support your body in amazing ways. Packaged in a 6 oz. recycled kraft bag.